She completed a doctorate in physics in 2004 at the University of California Irvine. Her academic background in astrophysics gives her a particularly analytical approach to Yoga both in her personal practice and as a teacher. Tammy has primarily worked in the fields of astronomical research and science policy since 2004 though teaching Yoga has been integrated into her time from the beginning of her professional training. She has integrated over 18 years of Yoga practice with her training to develop her own approach to teaching and practice that is strongly rooted in the ancient traditions but also reflective of modern interests and orientations. 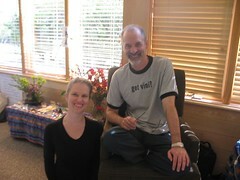 Her teaching style is directed toward the therapeutic applications of Yoga to the life of the individual. The Yoga Sutras of Patanjali are the primary guiding principles to her teaching and personal practice. People who work with Tammy learn how to use Yoga to enrich the quality of their lives from improving physical health to stress reduction and an increased sense of well being. In particular, she likes to ask students to consider why it is called Yoga ‘practice’ – Any kind of ‘practice’ is taking you towards a goal; What is your goal? She often offers the use of chanting, Yoga postures, breath work, visualization, self-reflection, and meditation in many of her classes based on the interests and needs of the students along with some other practices that can support one along the journey of life. People often ask, “Is this class OK for me?” Most classes are built for the students, so if you come to a class with her, you are walking in to ‘your’ Yoga class. In 2012, 2014, and 2016, she assisted Mirka Scalco Kraftsow in the Path to Wholeness retreats in Assisi, Italy. Tammy’s retreat blogs documents an amazing week of healing and learning – the 2012 story can be found here and the 2014 journey is here! Mirka and Tammy continue their collaborative efforts in ‘virtual’ Yoga classes via teleconferences and in-person workshops. Tammy is currently working to combine her extensive technical skills and interests toward helping to build mechanisms for Yoga teachers to reach students utilizing different media platforms. Stay tuned for more details of that work. She lives and teaches in Regensburg, Germany. Transmission of Yoga and Digital media work are a second career path. Since, the question comes up, now and then, about what Tammy did before turning primarily toward Yoga as a career path, here is a brief summary. She started working on her PhD in Physics in 1999 at the University of California Irvine with an interested in Astrophysics. Her degree is in Observational Astrophysics specializing in chemical composition of red giant stars in the Milky Way galaxy and some local dwarf galaxies. Her dissertation is entitled “The Ca II Triplet as an [Ca/H] Indicator and the Leo I & Leo II Galaxies”. For those interested, this was a collection of stellar spectra in the near infrared for RGB stars in stellar clusters used to develop an empirical relationship between some observational indices and actual calcium composition of the stars. An application of this empirical relationship was used on stars in the Leo I and Leo II dwarf galaxies can be found here too. During her time at UC Irvine, she also started an astronomy and astrophysics outreach program at the local observatory. She organized a program that reached thousands of adults and children in the community and in schools. It was the first such program at the University and has now become a corner stone of the Department of Physics & Astronomy. After her PhD, she moved to Germany with her fiancé but soon found herself back in the US, in Washington DC, pursuing work in science policy. She worked briefly at the National Academies of Science as a Christine Mirzayan Science and Technology Policy Graduate Fellow where she worked on supporting scholars in engineers, particularly focused on issues of minorities not traditional represented in engineering fields. In 2006, she became a American Association for the Advancement of Science; Science and Technology Fellow (quite a mouthful! AAAS S&T Fellow, for short). During her fellowship, she worked at the National Science Foundation in the Division of Astronomical Sciences on developing and supporting the national astronomy program. One her major contributions to the Division was a program she created calls PAARE (Partnerships for Astronomy and Astrophysics Research and Education). This program helped fund research and education partnerships between traditionally minority surfing instructions and primarily research institutions. This program has sponsored some fantastic collaborations for talented faculty and students from across the country. Toward the end of the AAAS, Tammy had a new calling and began to truly think about turning toward the path of Yoga that paralleled all of the work mentioned above. The deep inner work and deep connections with the many amazing scientists, educators, students and policy makers, kept calling her inward. Two small children helped the inner journey go even deeper, and eventually, her technical background and experience and training as a Yoga teacher took hold (in the background of the many science jobs, there was ALWAYS at least one Yoga class being fit into the schedule – if you are a scientist looking for a Yoga teacher (or a Yogi looking to know more about science), talk to Tammy.